How much energy we use and the type of energy we use directly affects our climate. You can help the planet simply by making the right decisions in regards to transportation, air quality, and energy efficiency which can help lower damaging effects of energy consumption. One of the best things you can do for your health and the envi­ron­ment is to buy local food. Farm­ers mar­kets, farm to table restau­rant choices and inno­v­a­tive pro­grams like the Rov­ing Radish make buy­ing local food easy. Proper care and treat­ment of the land in our area helps our forests and trees grow, offers food and pro­tec­tion for wildlife, and is used as farm­land to grow our busi­nesses and put local, organic food on our tables. You can help nat­u­rally pro­tect the land we live on for generations to come. Howard County has all the infor­ma­tion you need to recy­cle at home or at work. Learn which prod­ucts can go in your blue bins, the best way to recy­cle grass clip­pings, how to recy­cle elec­tron­ics and even how to com­post. Start recy­cling and help the planet, and our com­mu­nity, get health­ier today! Con­serv­ing and pro­tect­ing our water sup­ply is a job for every­one and is cost-effective and sim­ple to do. There are hun­dreds of ways to con­serve water – every­thing from turn­ing off the faucet while you brush to using low flow appli­ances. Learn more about how you can pitch in! Howard County has many groups dedicated to preserving and improving our environment. 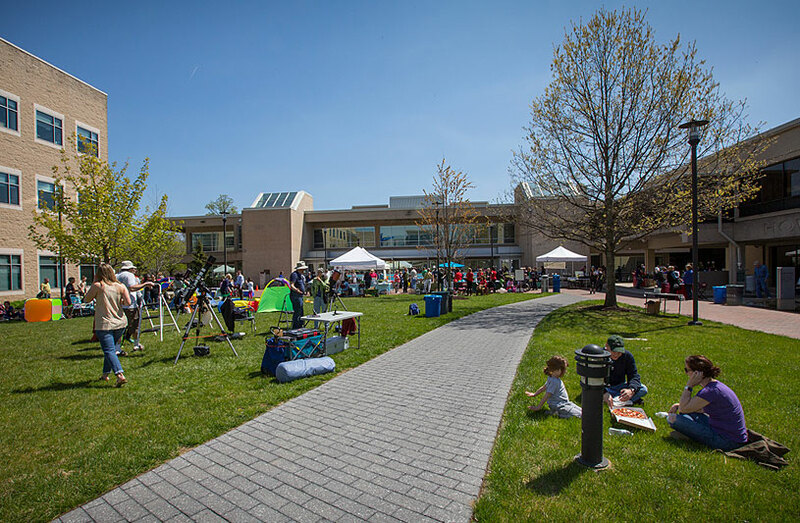 Learn more and get involved in making Howard County even more “green” by participating in educational programs or volunteering with local environmental groups. Are you inter­ested in learn­ing more about sus­tain­abil­ity and the envi­ron­ment? The fol­low­ing pro­grams offer train­ing so that you can learn, meet like-minded peo­ple, and chan­nel your inter­ests into vol­un­teer­ing at a higher level. LLEI is an eight-week envi­ron­men­tal edu­ca­tion and vol­un­teer lead­er­ship insti­tute offered as a non-credit course through Howard Com­mu­nity Col­lege. The LLEI course is usu­ally held on Thurs­days for 8 weeks from Feb­ru­ary through March. LLEI par­tic­i­pants are briefed by experts from NASA, NOAA, the Uni­ver­sity of Mary­land and other orga­ni­za­tions who explain cut­ting edge research on global cli­mate change, earth sys­tems sci­ence, the Chesa­peake Bay eco-system, sus­tain­abil­ity issues, and best prac­tices on leav­ing an envi­ron­men­tal legacy. The course cov­ers global sci­ence, regional ecol­ogy, local government’s eco-efforts, non-positional lead­er­ship train­ing, along with an intro­duc­tion to local non-profit and county envi­ron­men­tal orga­ni­za­tions and their vol­un­teer possibilities. For more infor­ma­tion, visit howardllie.com or email betsysing@gmail.com or cmhudson@comcast.net. Reg­is­tra­tion is done on-line at Howard Com­mu­nity College. The mis­sion of Uni­ver­sity of Mary­land Exten­sion Howard County Mas­ter Gar­den­ers is to “edu­cate Mary­land res­i­dents about safe, effec­tive, and sus­tain­able hor­ti­cul­tural prac­tices that build healthy gar­dens, land­scapes and com­mu­ni­ties.” Mas­ter Gar­den­ers receive class­room train­ing and can work in groups on vol­un­teer projects. Mas­ter Gar­den­ers have a vari­ety of vol­un­teer projects avail­able. A help­ful list of activ­i­ties is avail­able here. To learn more about how to become a Mas­ter Gar­dener, visit https://extension.umd.edu/mg/how-become-master-gardener. Uni­ver­sity of Mary­land Exten­sion Mas­ter Nat­u­ral­ists “engage cit­i­zens as stew­ards of Maryland’s nat­ural ecosys­tems and resources through science-based edu­ca­tion and vol­un­teer ser­vice in their com­mu­ni­ties.” Cer­ti­fied Mas­ter Nat­u­ral­ists receive class­room train­ing and some out­door train­ing as well. To learn more about how to become a Cer­ti­fied Mas­ter Nat­u­ral­ist, visit http://extension.umd.edu/masternaturalist. The Howard County chap­ter of the Met­ro­pol­i­tan Bal­ti­more Water­shed Stew­ards Acad­emy is a 15-class course that trains, sup­ports and empow­ers com­mu­nity lead­ers to serve as Mas­ter Water­shed Stew­ards in the pro­tec­tion, restora­tion and con­ser­va­tion of Howard County watersheds. Mas­ter Water­shed Stew­ards reduce the neg­a­tive impacts of stormwa­ter runoff in Howard County and are key play­ers in restor­ing the Chesa­peake Bay, by work­ing locally to reduce sed­i­ment and nutri­ents flow­ing into local streams and rivers that feed into the Bay. The Water­shed Stew­ards Acad­emy pro­vides oppor­tu­ni­ties for excit­ing, inter­ac­tive envi­ron­men­tal activ­i­ties, and sat­is­fac­tion gained from a job well done. To learn more, visit http://howardwsa.org/.